A billboard at the corner of Farwell and Ogden Avenues in Milwaukee says, simply, vote. WUWM's Maayan Silver reports on insights and concerns of the Milwaukee and state election commissions during these midterms. We've reported for weeks on the candidates and issues in Tuesday's elections. But what about what’s going on behind the scenes on Election Day — to keep polling places and vote tallying running smoothly and without outside interference? As voters head to the polls Tuesday, their wait times will depend on where and when they go. 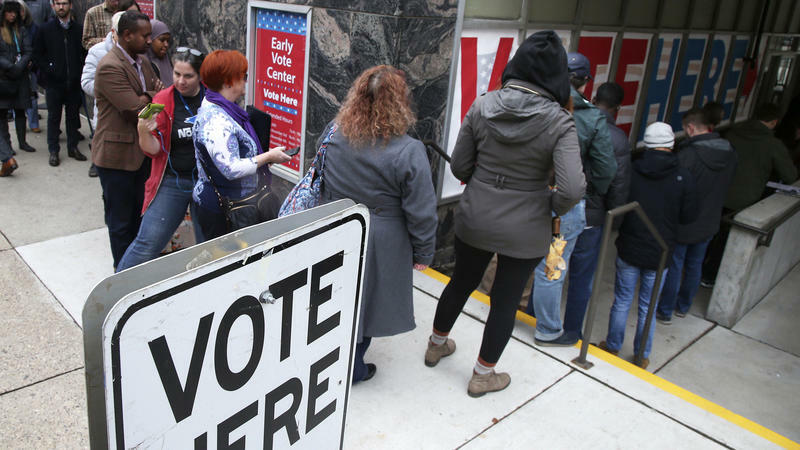 If they hit the polls from 7-9 a.m., voters may be waiting a little longer, says Neil Albrecht of the City of Milwaukee Election Commission. He says if voters can swing it, it may be preferable to vote at other times — to save themselves time and also to spare people trying to get to work. But in looking at overall voter turnout, Albrecht says midterms usually don’t get as many voters as presidential elections. "In 2016, we had 241,000 voters in the city of Milwaukee for the presidential [elections]," he says. "We’re projecting around 200,000 to 205,000 for this midterm." But there’s one thing that’s trending upward both locally and nationally, says Albrecht, and that’s early voting. He says this year the state of Wisconsin broke records for early voting — as did Milwaukee. Albrecht says there are a lot of contributing factors. One is people are concerned about their election day schedule. He says another is voter enthusiasm, but a third is more awareness about early voting because of promotion from the media, the parties and the candidates. Albrecht says Milwaukee has the state’s highest concentration of people in poverty, who are already less likely to vote. He says they’ve offered online voter registration and registration kiosks and have encouraged poll staff to work with people to meet the photo ID requirement and residency requirements. While voter access is an issue, so is election security. Reid Magney is with the Wisconsin Elections Commission. He says the state launched a brand new statewide voter registration system in 2016 to be ready for any hacking attempts. Magney says Wisconsin’s system has also traditionally had a lot of protections built in to prevent ballot box stuffing. He also says the state elections commission has been working with the Department of Homeland Security to quadruple check the systems to make sure they are secure. Last week, Gov. Scott Walker issued an order allowing the Wisconsin National Guard’s Cyber Security Team to assist the Wisconsin Elections Commission if their help is needed. Magney says his organization has been working very closely with the National Guard for quite some time, and that voters are not going to see any difference at the polls." The Milwaukee District Attorney’s Office and the U.S. Department of Justice also have a role to play in making sure the elections are secure. They have call centers and attorneys on staff who can respond if an issue merits follow-up. The Milwaukee DA's Office call center is at (414) 254-0991. Complaints about possible violations of the federal voting rights laws can be made directly to USDOJ's Civil Rights Division's Voting Section in Washington by phone at 1-800-253-3931 or (202) 307-2767. Climate change is dominating some voters' concerns, including 16 Alverno College students who've been exploring the global issue in an elective course taught by biology professor Chris Young. He describes this batch of students as the most engaged and eager to discuss the complexities of climate change of any class over the years. Yet, many told him they hadn’t heard about the gravity of climate change before taking his class. Republican Gov. Scott Walker and Democratic candidate Tony Evers met for their second and final gubernatorial debate with the election more than a week away. Polls show the race to be a dead heat. Moderators opened the debate by asking the candidates how they would plan to bring all their constituents together in today’s bitter partisan climate.